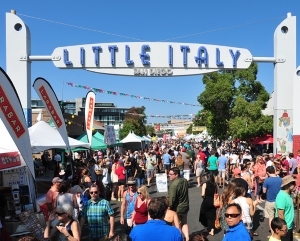 Today San Diego's Little Italy is a bustling commercial, dining and entertainment district. But more than a half century ago, it was a largely residential area populated by Italian families, most of which were involved in San Diego's thriving tuna industry. Over the next few decades, Little Italy became a self-contained neighborhood with its own grocery stores, bakeries, restaurants, a Catholic church, an elementary school, a drugstore, and a fire department. Then a half century ago the community was cut in half by the expansion of San Diego's freeway system, devastating a once thriving community. Read about Little Italy's rich past and about local efforts to preserve the neighborhood's unique ethnic character and identity.